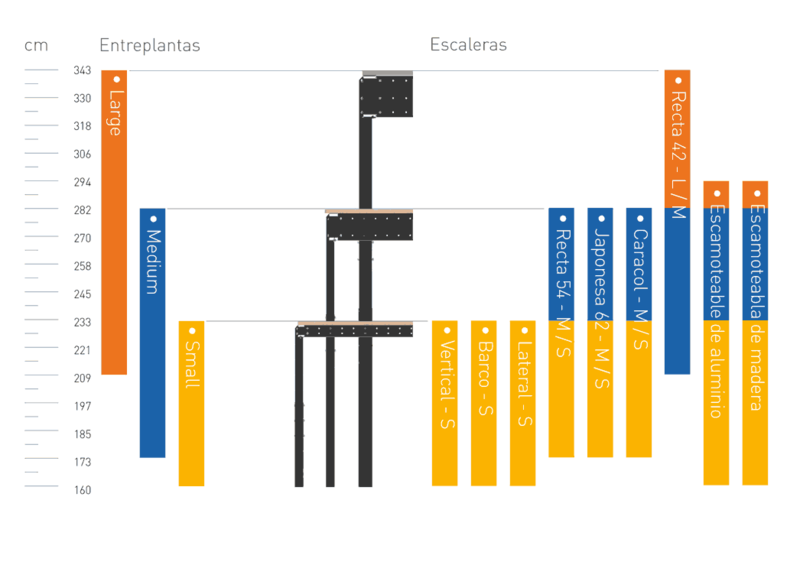 Firstly, Tecrostar mezzanines are adjustable, meaning that one structure permits different height, width and length configurations. The following video is a demo of how it works. Another distinguishing feature is that you purchase them online and we will send you a kit that is so easy to install that you can assemble it yourself, without any special tools or knowledge. Customisable with a range of stairs, railings and accessories. Once you understand the nature of our product, the next thing to do is to choose the structure that best adapts to your needs. To do this, choose the height at which you wish to attach the mezzanine. There are three categories according to the height and there are various mezzanines in each category, according to the surface and material. Ideal for a mezzanine, loft bed, modern mini-loft at home and in the office or for creating a small storage space in a garage or storage room. Maximum load bearing capacity 1400 Kg // 800Kg/m². Maximum load bearing capacity 3000 Kg // 700Kg/m². Designed to be used in industrial units; they are very robust mezzanines with such a simple assembly and extension system that you can assemble it yourself without contracting a builder. Maximum load bearing capacity 11500 Kg // 800Kg/m². You can add stairs, railing and accessories. The height is adjustable every 12 cm and the width and length every 10 cm. The surface area can be extended using the extension kits. These kits are also height adjustable and the surface of the mezzanine can be duplicated. The structure does not need to be resting completely against the wall. 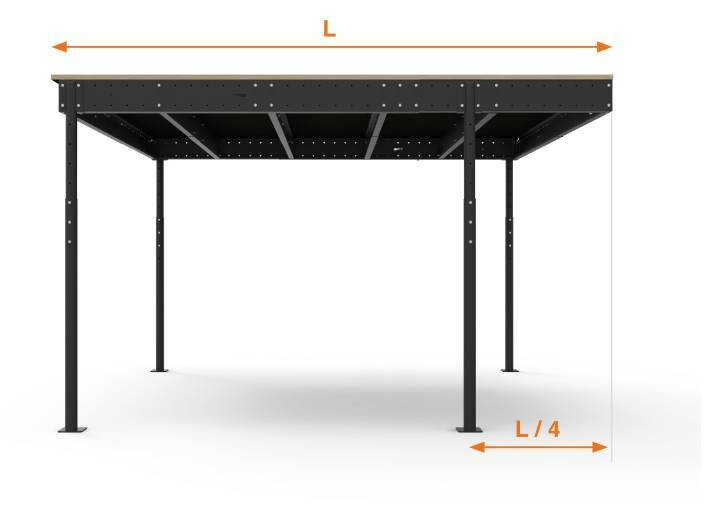 You can adjust the structural floor, to address architectural barrier or uneven surface issues. The columns can be up 1/4 of the total length of the structure away from the corners. Once you are sure which structure you need, the next step is to choose the type of stairs you wish to install. All of our stairs can be installed on any of our structures and, like them, are height adjustable. We have 9 different types of stairs, to ensure that the height is compatible with the mezzanine you have chosen. Consult the following table. In addition to the type of stairs, you can choose the configuration that best adapts to the final location of your mezzanine. Case 1: Outer stairs, perpendicular to the mezzanine. Case 2: Inside stairs. You will need a stairs beam. Case 3: Outer stairs, parallel to the mezzanine. You will need a landing. The next step is to decide whether you want a safety railing. 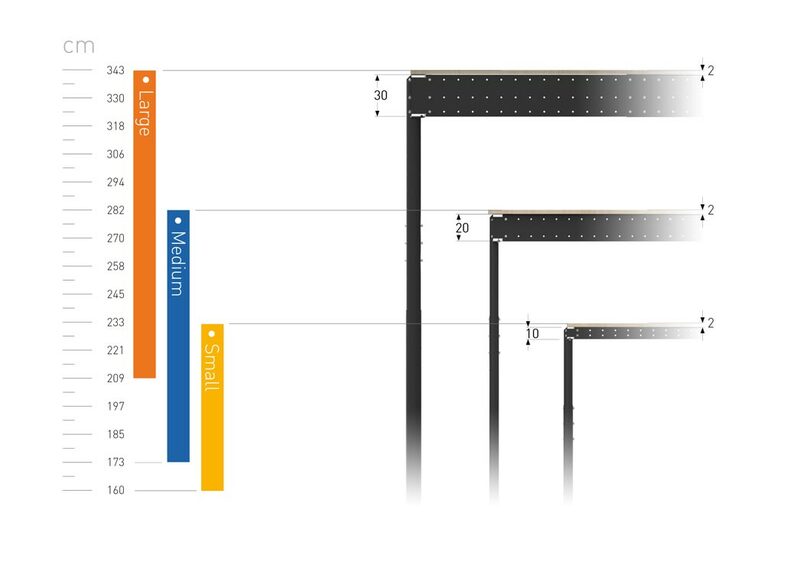 We have six types of railings with different heights and configurations, which adapt to any use you may give your mezzanine. One of the most important sections is attaching the mezzanine. For greater safety and stability, we recommend attaching the columns to the floor using the fixing included in the kit. We also recommend attaching the mezzanine to the adjacent walls in order to stabilise the structure. The pieces for attaching the structure to the wall are also included. 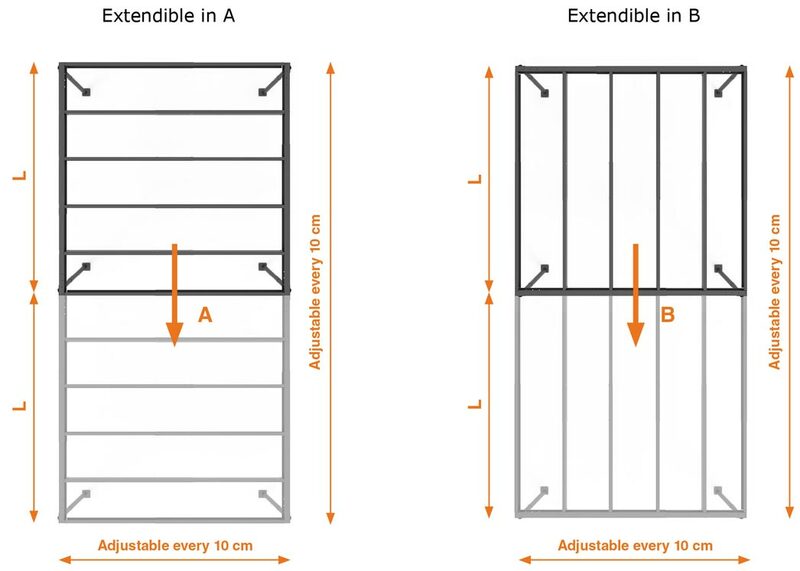 Depending on the number of adjacent walls, you will need to install stability kits. 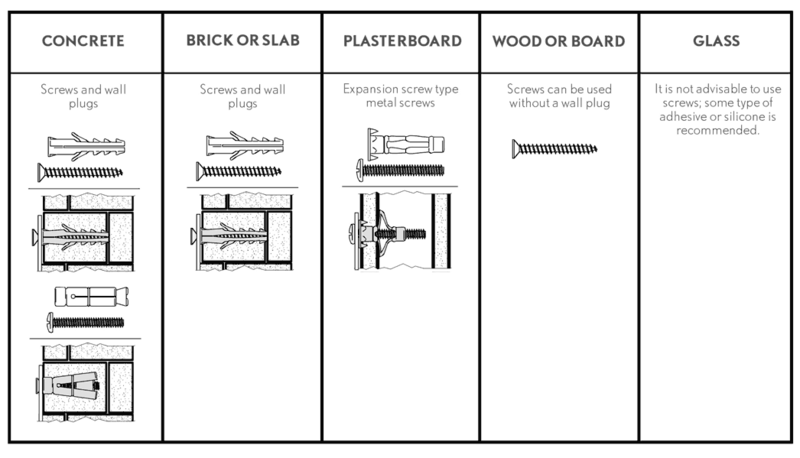 The following table shows the bolts needed according to the adjacent walls. Las paredes pueden ser de diferentes materiales, en función de los cuales se debe seleccionar un tipo de tornillo u otro para fijar la estructura a la pared. To finish, add accessories to your order with which you can give your mezzanine a personal touch so that it is unique and functional. These are just some of them; you can find them all on our website. You may also select any colour from the RAL range https://www.ralcolor.com/ for us to paint your mezzanine.